Bravery and heartbreak at a live cattle "market"
How does it feel to be filming this? Part of me has to die in order to not go mad. I feel worse that my companion, a native Telugu speaker copped the worst of the abuse while I was (even from Delhi), clearly a foreigner, and the cowards chose to yell at her rather than me. As a final comment, cattle abuse is not remotely an 'India problem' and let no one think that cattle anywhere else in the world live better/easier. It is the meta-animal in terms of profits, and commodification on this scale of sentient beings means devastating violence - everywhere. Below is a small selection of the tamer of the 500+ pics that I filmed nonstop at the live animal market near Visakhapatnam that is representative of loading zones for cattle trafficking throughout India. 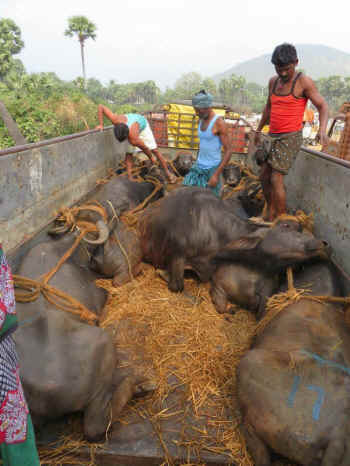 I only stopped on the second day when the when we were screamed at to stop while I was filming repeated deep rod-rapes of buffaloes one after another while loading as they are loaded onto the slaughter trucks - routine with every animal as s/he tries to run from the truck in panic. We were two women armed with little more than raging anger, sorrow and a camera. Filming also strangely lets you "not see" and look at the horror indirectly. I have not had the guts to look at any of my video footage afterwards - though they are saved in several places and WILL be used! Animal markets [shandies] is a cancer for the animals. 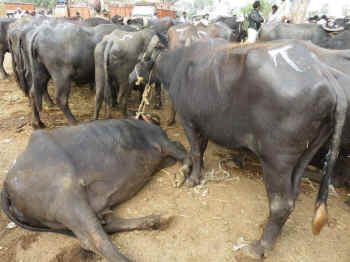 Buffaloes and cows and Bulls and young babies die in the market itself. The pregnant ones give premature births out of fear and trauma. There are deaths. There is fear and apprehensions. There are tears. The young ones separated in the market itself. And it is all nothing but a KILLING FIELD for the large animals Cruelties of all kinds are present in shandies. While we go around trying to talk to officials to maintain some rules for them and show mercy while being handled and traveling. There is no answer but abusive words, abusive gestures and threatening gestures. Many a time I had my cameras snatched and thrown away.